Get ready for a fresh wave of updates to Kona. You’ve been asking us to maximize your working space, give Kona a more professional look and maintain the simple welcoming feeling of Kona. That was a tall order but we have been listening, designing, testing and are now ready to deliver. 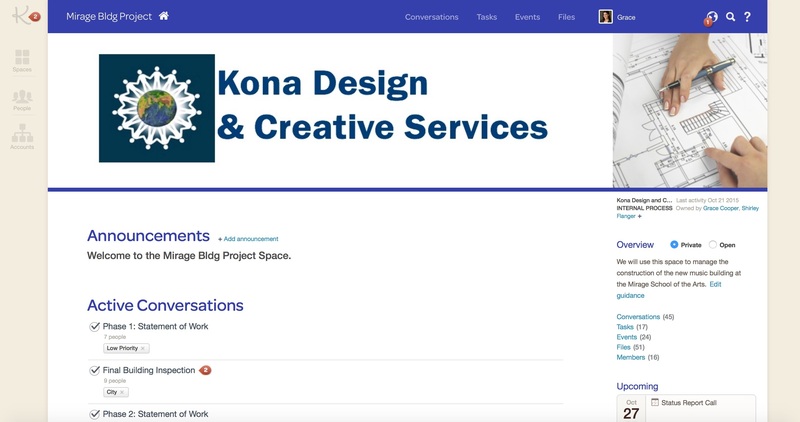 We’ve refreshed Kona’s color scheme with a professional new blue design and beige backdrop. Edges are sharper and better contrast so your important information is easier to see. To make it easier for you to find what you’re looking for, we’ve grouped your Global Notifications, Kona search and Kona support on the right side. For you power users, advanced search is still accessed the same way using the down arrow. Your unread conversation notice stays with the Kona icon as you move from your My Kona view to a Kona Space, keeping you one click away from what’s new. No more tabs. Navigation has been moved into the header to give you more screen real estate for what is most important to you. Your existing space images will appear on the right and a new wider space image is now available on the left so you can further highlight your space with a corporate, initiative or space identity. A new home icon is now available for quick access to the space overview page. We’ve given Kona more than just a makeover. With this new release you’ll find easier navigation to your spaces, better ways to manage your space attributes, people and connections as well as new filter options and much more. For our existing Kona users we know you’re going to love the new look and feel and we look forward to continuing to bring you improved ways for your teams to get things done together. For those considering Kona, there’s never been a better time to ride the wave! Click here to learn more about what Kona can do for your business. 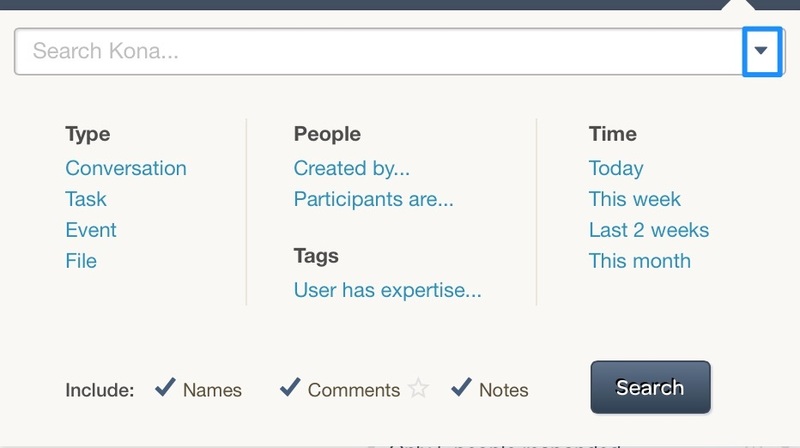 Create Polls in Tasks & Events and more ways to Collaborate! Look what has arrived just in time to coordinate the company summer outing! Now you can add survey or sign-up polls to tasks and events in the same way that you add polls to conversations. 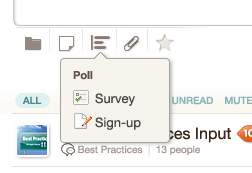 To add a poll to a task or event, click the “Poll” icon (three horizontal lines) when creating the task or event. 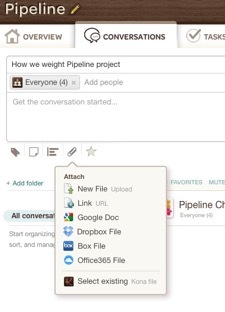 Improved file sharing for Google Docs and Office 365 Users. Microsoft Azure / Office 365 file integration is also available, Administrators can enable this for their Kona Business account. 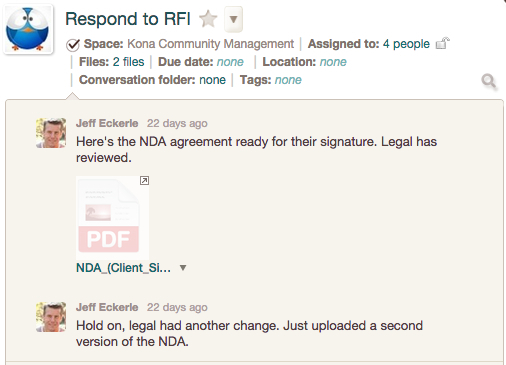 Users will then be able to share files between Kona and their Office365 account. Looking to pack your briefcase and laptop with essential documents for your business trip, team meeting, or more? You can now download multiple files at once from Kona, making it quick and easy to retrieve information that you need that has been uploaded to Kona. Using the batch edit feature on the Files tab within a space, select the files you’d like to download and then click the Download files icon (to the left of the folder icon). All selected files will be pulled into a ZIP file and added to the space, made accessible only to the person requesting the download. From there, download that single ZIP file to have all the files you need! Kona Business accounts can take their Spaces, much like their briefcases, with them into other business arenas. 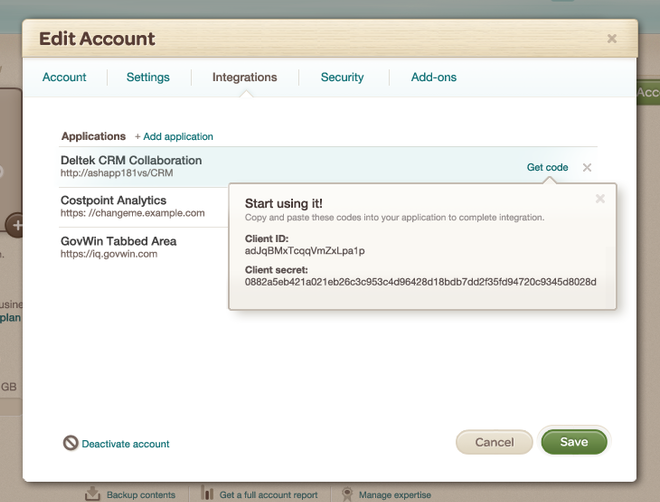 Admins can integrate the Kona widget into other applications, like the ones listed below. To make it easier to manage your various applications, we’ve implemented a hover feature; after adding in your application, just hover over “Get code” alongside the app name and copy the Client ID and Client secret as needed. Please visit the Kona Help Center for more detailed instructions on using these great new features! We’d also like to hear your feedback and ideas, so while at the Help Center, consider leaving a feature request or comment on an existing one. We’re back with new updates! Polls were so popular that we decided to add an additional Poll type: Sign-up. Users are now presented with the option to create either a Sign-up Poll or a Survey Poll. Sign-ups are great for instances where users need to commit to a certain time or activity in order to move things forward. One way an organization can use this new feature is to schedule drop-in IT support appointments. Create a Sign-up poll with available time slots and ask the teams in your office to choose a time that works best for them. Another example is to create training sessions with a limited number of seats in each session,and ask participants to sign up for a specific seat (such as Monday – seat 1, Monday – seat 2, etc.). As with Survey polls, Sign-up creators can select to allow or disallow users from selecting multiple items. Multiple users cannot select the same item; once an item is selected, it is no longer available for selection. After signups are made, the creator will have an aggregated view of the selections made by the group. For Kona Business admins, we have added automated space backups that will occur on a recurring basis; this feature must be turned on from within account settings. Admins can select one backup frequency to be applied to either all active spaces or a selection of active spaces; choose from Daily, Weekly, Monthly or Annually. Kona conversations are often filled with valuable updates, suggestions and even opinions. These kinds of comments don’t always need a reply; a quick thumbs up will do the job. 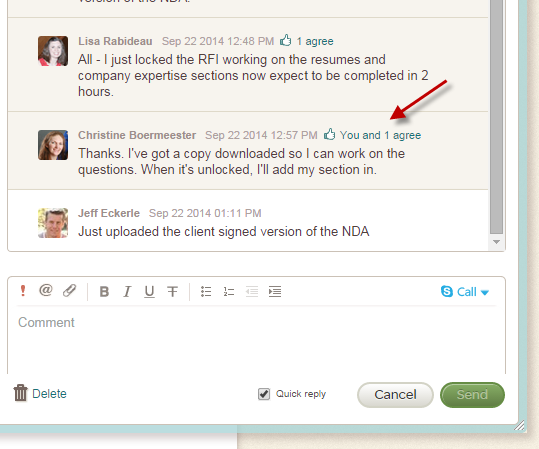 With the new Agree feature, you can show your support on as many comments as you’d like. Hover over the comment to activate the thumb icon, which will display to the right of the comment. Clicking on the agree will show you all the people that agree with the comment. For our Kona Business Admins, we made some visual changes to user status on the Account Overview page and in the Member Network space. 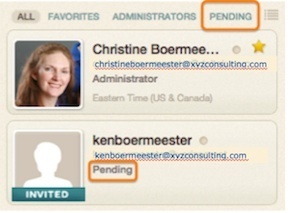 From within the Members section of the overview page, invited users now appear as Pending, so admins know which people need to be resent invitations. Since releasing file versioning for Kona Business spaces in our last release, we have already made some improvements. The file image icon within the conversation will be frosted if the file is checked out, eliminating the need to check the file details to see the file’s check-out status. You can also delete individual file versions from the info tab on the attachment itself. If the file was shared within a conversation, you can also delete file versions from the version popup within the conversation. Let us know what you’d like to see in Kona! Submit original feature requests here.